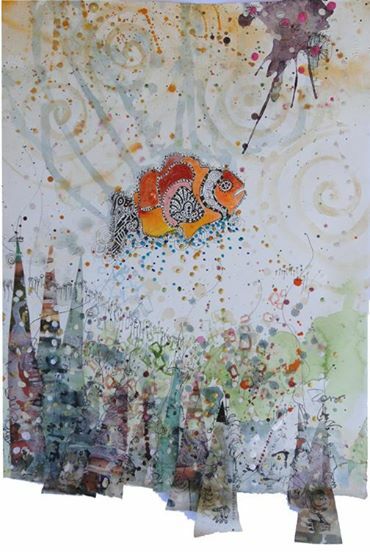 Just in from the Art Projects Paia in Hawaii… The Orange Fish (30″x22″; oil, acrylic, watercolor, ink on arches) has been sold. And, I’m in process of painting two more for shipping soon. Thank you to APP and to the new owner of this piece of art. This entry was posted in Fine Art Process, SOLD! 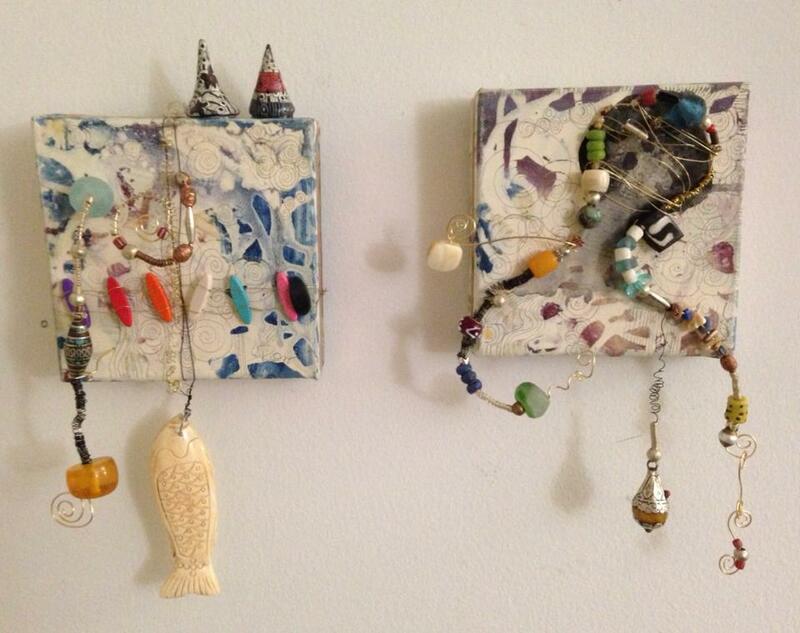 and tagged art projects paia hawaii, fish artwork, los angeles fine artist, Notes: Karrie Ross, sold art from karrie ross on September 8, 2014 by Karrie. 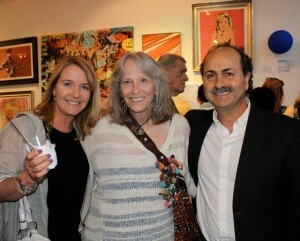 The family who bought “The Tree” saw it at the Beverly Hills Art Show and we talked for several months about it. I’m happy to report that it was SOLD and is happy in it’s new home. I consider the painting one of my signature pieces, not only for its size but for the detail and new explorations it holds. I used a variety of paints: oils acrylics, metalics and gold leaf. The pencil spirals again cover the image and the ink drips and spirals enhance the mystery. Thank you to the collector. May you enjoy it for many years. “The Tree” being wrapped for delivery. 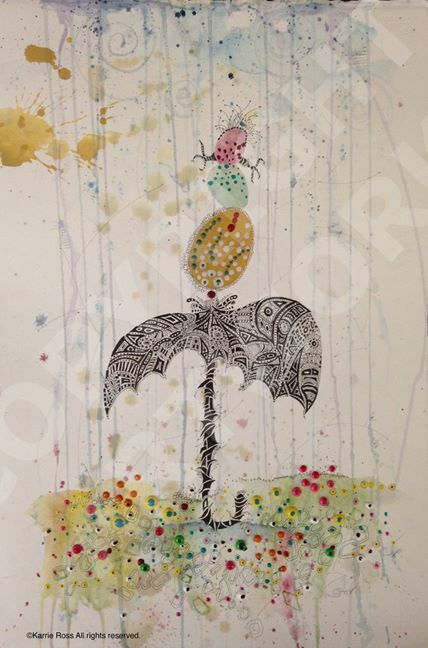 This entry was posted in My Trees Talking Posts, Notes: Karrie Ross, SOLD! 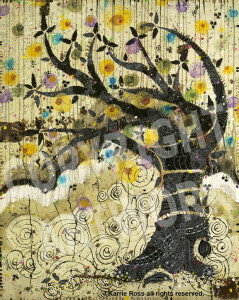 and tagged los angeles fine artist, my trees talking, Notes: Karrie Ross, sold find art, Spiral Series on October 30, 2013 by Karrie. A Window Between Worlds is a nonprofit organization dedicated to using art to help end domestic violence. 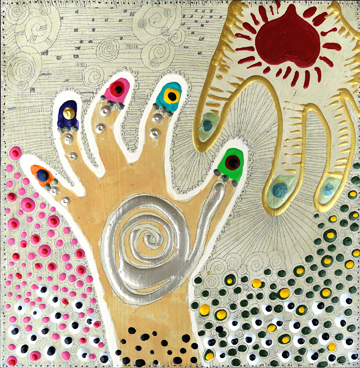 Through creative expression, battered women and children gain a sense of renewal and power. Their images of hope, survival and strength educate the public and become “a window between worlds” for survivors taking steps to change their lives. 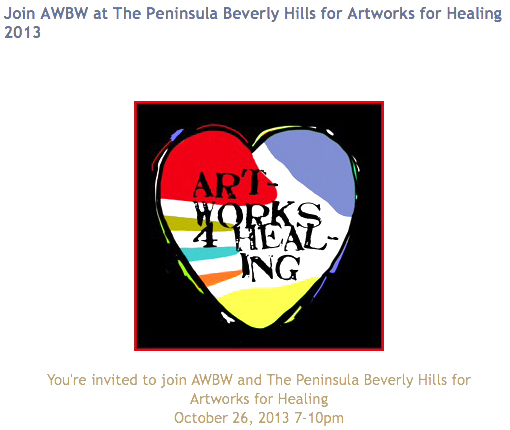 An elegant and heartfelt affair featuring a unique opportunity to collect art by established and emerging Los Angeles-based artists created especially for this event. The piece I submitted was two hands reaching/touching. Was the first to sell to a very nice collector. Thank you. This entry was posted in Exhibition Posts, SOLD! and tagged los angeles fine artist, Notes: Karrie Ross on October 27, 2013 by Karrie. “City & Self” Group one day show curated by Mat Gleason who is also having an opening at his new gallery Sept. 14th … don’t miss it. SOLD: the piece “City” Thank you to the collector. I will have two pieces in the one-night-only art event at Red Pipe Gallery, “City & Self” featuring 30+ LA artists who have created new works over a 3-week period to celebrate their experience of “life in the ‘city’ and the ‘self’ within it.” A broad spectrum of perspectives, styles, and mediums will be on display. The show is curated by Mat Gleason. This entry was posted in Exhibition Posts, Notes: Karrie Ross, SOLD! and tagged curator mat gleason, los angeles fine artist, Notes: Karrie Ross, red pipe gallery on September 9, 2013 by Karrie. 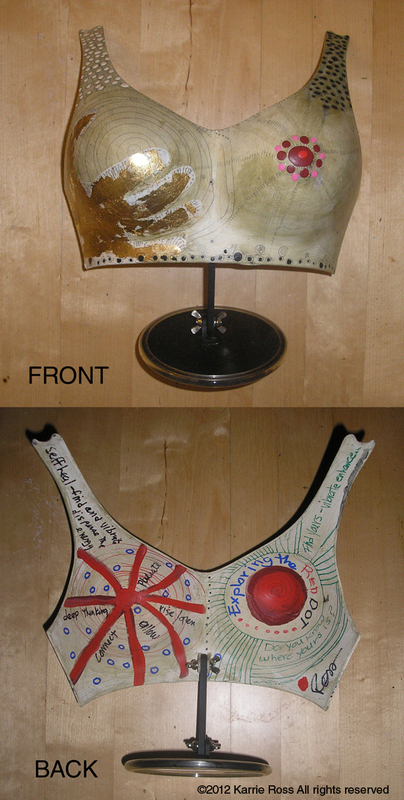 I’m happy to announce that the artwork “Left/Right” Bustier, has been SOLD! at the Out There, show, a special exhibition celebrating the LGBT experience during West Hollywood’s Pride Month festivities at Gallery 825, June 8 – June 15, 2012. Los Angeles Art Association (LAAA) and the City of West Hollywood are proud to announce the fifth annual Out There exhibition celebrating the LGBT experience during West Hollywood’s Pride Month festivities. This effort commemorates West Hollywood’s lasting commitment to raising public awareness and appreciation of the talents and abilities of all artists. The Out There exhibition opening at Gallery 825 on June 8 is an all-media exhibition juried by Francisco George and William Escalera. Out There celebrates and acknowledges the special opportunities that West Hollywood provides for creative individuals. Out There is made possible by the City of West Hollywood. Out There runs June 8-15 at Gallery 825. Featured Artists: Ruben Acosta, Sarah Barnard, Gary Frederick Brown, J.T. Burke, Jarred Cairns, Ellen Cantor, Joanne Chase-Mattillo, Michael Chearney, Nicholas Coroneos, Yu Cotton-Well, Adrienne Davis, Jolly de Guzman, Jose L. De Juan, Raul De La Torre, Wanda Decca, Jack Dorlan, Lore Eckelberry, Hadiya Finley, Helane Freeman, Dwora Fried, Norbert Garcia, Michael Giliberti, Teale Hatheway, Eileen Hespen, Kirk Kain, Motoko Kamada, Jim Keville, Linda Kunik, Teresa Lakier, Echo Lew, Gray Malin, Mary Grace McKernan, Daniel Monteavaro, Andy Moses, Marin Murakoshi, Michael Ochinero, Mei Xian Qiu, Burton Rein, Rachael Rendon, Karrie Ross, Dennis Ruble, Linda Jo Russell, Susan Sanchez, Heather Scholl, Sharron Shayne, Rena Small, Ashleigh Sumner, Hui Tan, Phil Tarley, Joseph Terrill, Vincent Tomczyk, Tim Townsley, Ariel Vargassal, Frank Ventrola, Cathy Weiss, Davyd Whaley, Karen Frimkess Wolff and Joan Wulf. This entry was posted in Bustier Posts, Exhibition Posts, Notes: Karrie Ross, SOLD! and tagged bustiers, los angeles fine artist, Notes: Karrie Ross, Sold artwork on May 23, 2012 by Karrie. 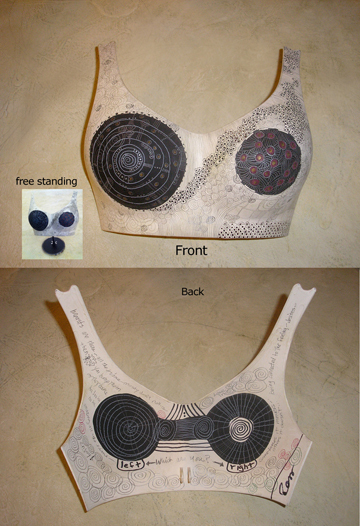 I am so excited that the bustier for Gallery 825 Sold and the owner will be enjoying it for a long time. This piece is inspired by a fascination with the red dot, not only just the simple dot but the concept of using a red dot to indicate a sale… the back inquires if you have found yours yet? This entry was posted in Bustier Posts, Exhibition Posts, Notes: Karrie Ross, SOLD! and tagged bustiers by Karrie Ross, Exploring the Red Dot(s), los angeles fine artist on April 23, 2012 by Karrie. 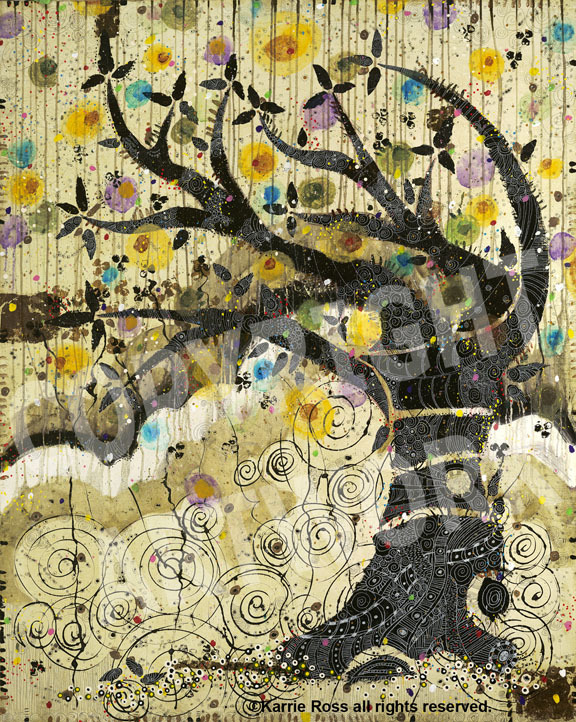 Giclee Print Sold: 40″x 40″; the print will be embellished with live paint dots for a special effect. I am happy to say that this print will be heading up to Palo Alto for framing and installation in a private residence. Karrie Ross is a Los Angeles Fine Artist who writes about fine art business and process. She is available for educational panel discussions on her fine art and process. Her artwork is available for solo or group show, installations and public art opportunities. Please contact her at email for more information. This entry was posted in Drop Dot and Red Dot Posts, Notes: Karrie Ross, SOLD! and tagged fine art, los angeles fine art for sale, Notes: Karrie Ross, Sold Karrie Ross artwork on April 16, 2012 by Karrie. I’m excited to announce that Spiral Series: Bustiers: “Oh The Two of Us” SOLD at the LAAA annual auction to Lori and Herair Garboushian of Los Angeles. This is the first Bustier I painted/drew in this series. I started the beginning of this year and I now have 15 finished with more to come. Being the first one, it was painted most similar to my Spiral Series paintings in its approach with the drawing and painting applied to the “canvas” of a plastic bra form. This seems to be classified as a sculpture since it is free standing but I did not do the form. I plan to explore that avenue later. I consider this a painting/drawing. This entry was posted in Bustier Posts, Notes: Karrie Ross, SOLD! 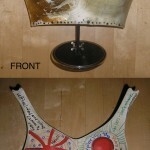 and tagged los angeles fine artist, Notes: Karrie Ross, Sold artwork, spiral series bustiers on July 31, 2011 by Karrie. 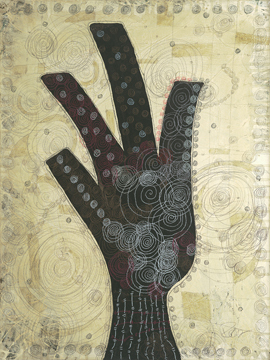 My piece Spiral Series: “Hand Magic”; 24 x 18; mixed mdeia on canvas; 2010; was one of the pieces selected for display in the annual fundraiser. The Kickoff to LA’s Spring Art Season! This entry was posted in Exhibition Posts, Notes: Karrie Ross, SOLD!, Spiral Series and tagged fine art, Gallery 825 Gem" show, Karrie Ross fine artist, LAAA GEM show, los angeles fine art on March 25, 2011 by Karrie. A portrait of the people who make us smile. 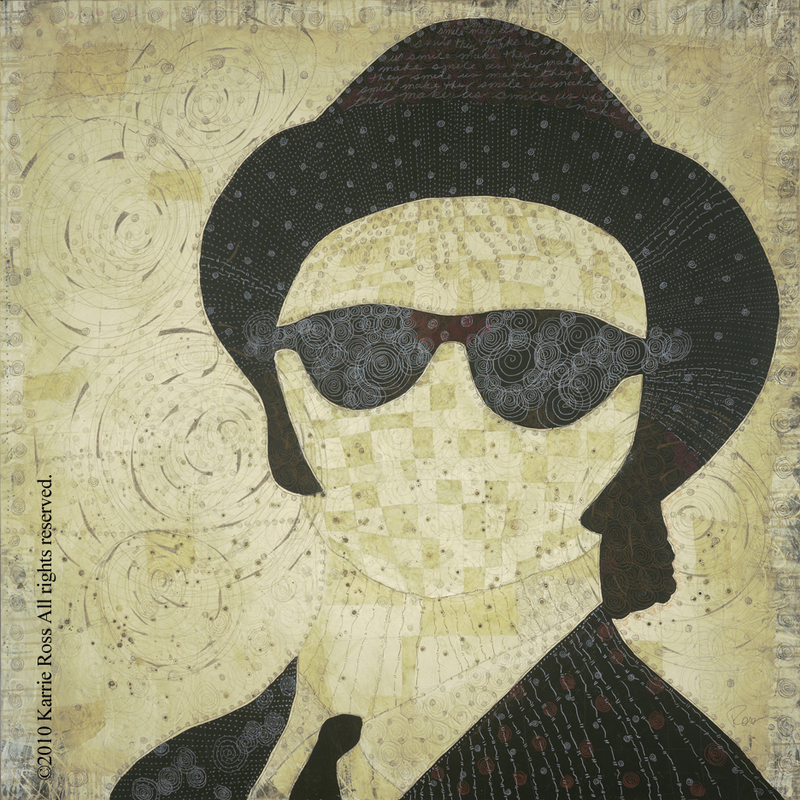 Taking from my son, Orbison, Cash, Holly, Belushi… using symbols found everyday yet attributed to certain feelings, a hat, sunglasses, suit and tie conjure up our relatedness to those who have inspired us over the years. If you find yourself stuck on what to paint next… ask yourself a few questions and see what comes up. Look around your home, think ‘something you haven’t done before’ like a portrait or landscape or abstract! What happens will get your creative juices flowing once again. Who has inspired you? Tell us about them. That’s it for now and don’t forget to sign up to receive my Art Notes by email in the upper left corner side column. 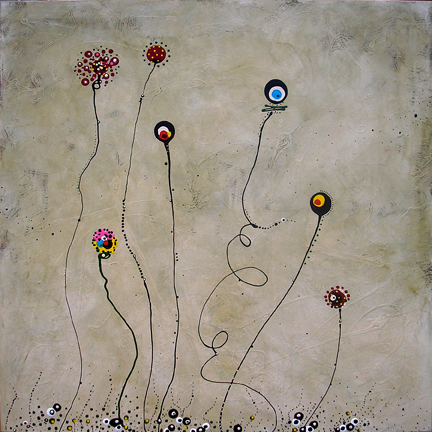 This entry was posted in Fine Art Process, Notes: Karrie Ross, SOLD! and tagged los angeles fine artist, Notes: Karrie Ross, people who make us smile, portrait on July 6, 2010 by Karrie.